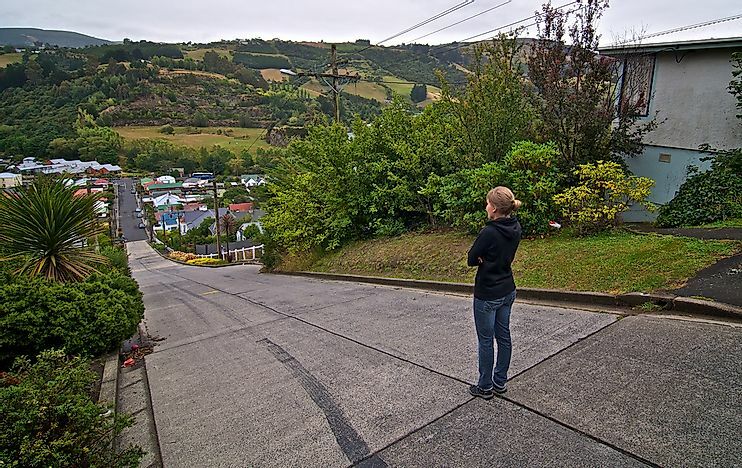 According to the Guinness World Records, Baldwin Street, in Dunedin, New Zealand is the world's steepest residential street. The steepest street in the world, the Baldwin Street of New Zealand. New Zealand is known for being the home of kiwi birds and rugby. However, in recent years, the small town of Dunedin, New Zealand is bringing New Zealand to the world map for a bizarre but fantastic reason. Baldwin Street is a short residential street located in the city of Dunedin, New Zealand. The 1,150-feet long street is relatively short but is known all over the world for being the steepest residential street in the world with a slope of 19 degrees. Baldwin Street was named after an Otago newspaper founder named William Baldwin who subdivided the location of the street. The famous city has its origin in a planning error. The planners in charge of this part of Dunedin had no information about the topography of the area and were only drawing the plan of the street on a map. The location of the street is about two miles from the Dunedin city center and connects the North Road to Buchanan Street. The streets running parallel to Baldwin Street include Dalmeny Street, Calder Avenue, and the Arnold Street, all of which are also very steep. The gradient of the street and the surrounding area has caused residents to adapt and build houses with unusual shapes that defy many architectural principles. These houses attract many photographers who take pictures of the houses which have an illusion of sinking into the ground. Walking up this short street leaves people short of breath but can be refreshed by a water fountain located at the top of the slope. The high slope of the street was a construction challenge, and contractors used concrete to lay the street instead of on asphalt. Due to its global fame, Baldwin Street is host to several annual events which attract thousands of participants from all over the world. The most famous are the Baldwin Street Cadbury Jaffa Race which is an annual charitable event where thousands of round candies known as “Jaffas” are dropped down the steep slope. The Jaffa Race idea was conceived after a 1998 similar event where tennis balls were dropped down the street with proceeds going to Habitat for Humanity. Proceeds from the race go to charities around New Zealand. Another notable event is the annual Baldwin Street Gutbuster, a race where participants run up and down the street and try to break the 1:56-record which has been in place since 1994. The Gutbuster attracts people from around the globe who compete in the several categories which include one for children, the elderly, and even skaters. While many people visit the street for its scenic slope, a few individuals come to try tricks which often have tragic results. In 2001, two young university students tried to run down the street inside a bin which ran into a trailer, and one of them died with the other received severe head injuries. Another incident happened in November 2009, when three men took turns riding in a bin towed in a car and were later arrested and charged with dangerous driving. Which Is The Shortest Street In The World?